♥ I am thankful to God for strengthening me day by day. I was very unwell last week and could not do much thing. I rested most of the time and read or listen to sermons. Thank God for His Words that strengthens us in our bed of afflictions. Thank you for your prayers! ♥ For today's Thankful Thursday, Laurie wrote about God has placed gifts in each of us that we can use for His glory. She said "God is not looking for the "perfect" package, only a willing and an obedient vessel." Indeed, we are but instruments in the hands of mighty God! He has given us different gifts and talents so that we may use them for His glory and the extension of His kingdom. And thank God that He made us all very different and gave us different gifts, so that we can function in different capacity in the body of Christ. So we are not all the same, but we are unique - uniquely gifted by God for His eternal purposes! Praise Him! ♥ I am thankful to God for giving me the gift and joy of making homemade gifts for friends. It is a joy and privilege to serve God in little ways like these. Here is another Homemade Christian Calendar 2010 that I like to share with you. I took the pictures of these lovely flowers at a flower exhibition at Changi Airport, Singapore. 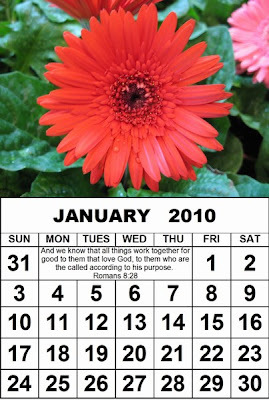 I used these flowers pictures to make these Christian Calendars 2010 with Bible verses that encourage me. 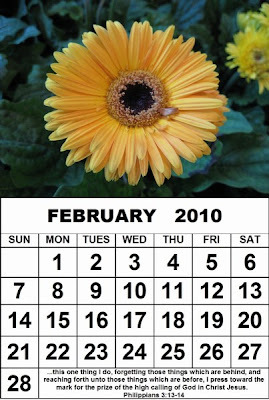 Do feel free to download these Christian Calendars 2010 and make them for yourself or your friends. You can also sell them and I don't mind! 3) Or you can open any word processor program such as Microsoft Word or OpenOffice and insert the Calendar into it. Then you can format the size, etc, and print from there. Nancie, you are very talented at photography. 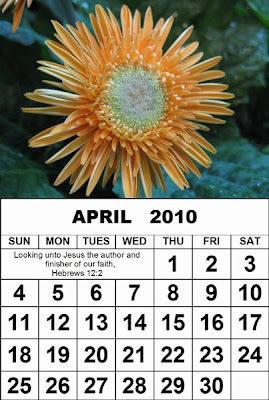 I love the beautiful flowers and how you used Scripture in the calendars. Very lovely and generous of you to allow us to download them. Nice blog. 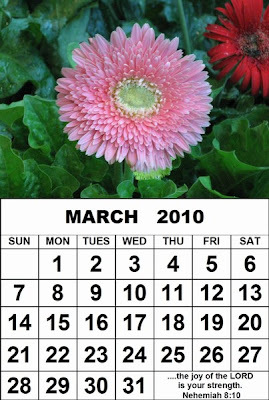 I really like your 2010 flower calendar. Where can I buy this and at what cost? Bless you my very talented friend, love you. Thank you for your sweet comments you left me yesterday. They meant so much to me. You are so sweet. Merry Christmas! I probably won't be blogging for a bit due to the holiday. I really enjoy seeing the flower pictures. Thanks for sharing. Thanks, Debbie, for stopping by and your encouraging comment. It is my joy to share God's blessings with you and all the wonderful friends in this blogging world! Take care and God bless you! Thanks, Flower, for stopping by and your kind comment. Thanks for your interest in my calendar! These calendars are for FREE Download and I do not sell them. I sell a simpler version on my website at : http://homemadegifts2008.blogspot.com/. There are catalogues there of bookmarks, cards and calendars all with Bible verses. Let me know if you are interested to purchase any. Thanks. Take care and God bless you! Thanks, Denise, for stopping by. I love you too. Take care and God bless you! Thanks, Becky, for stopping by. Thanks too for your sweet comments here :) They are always great encouragements to me and I thank God upon every remembrance of you. Take care and have a very blessed and wonderful holiday seasons. God bless you and family! Thanks, Rita, for stopping by. So glad that you enjoyed the sharing. Take care and God bless you! Hi Becky, you are most welcome! Thanks for your sweet comments too. They always make my day :) Take care and may God bless you and family always! This year everyone is getting homemade by me :) It's getting back to the simple things in life. I love "simple"! It removes a tremendous amount of stress. Hi Darlene! Yes, "simple" removes a tremendous amount of stress. I am glad you are getting back to simple things in life! Thanks for dropping by and all your encouragements. Thanks to you too for being here for me :) You made a difference with your encourage comments :) Take care and may God bless you through this week. Such a lovely Thankful list. The calendars are beautiful! Thank you so much. I truly appreciate your faithfulness and your prayers. God bless you. Thanks for stopping by, Michele! It's so good to hear from you. Thank you for your prayers and encouragements too. Take care and may God bless you abundantly! The calendars are lovely, Nancie! Just dropping in to wish you a blessed Christmas filled with love & joy and a peaceful New Year! Good to hear from you.I am doing well.Thank you for the thoughts and prayers.Hope all is well with you.Have a Merry Christmas to you and your family.God Bless. It's so nice to come to your blog knowing that I'll find encouragement. Thank you for being a blessing. Thanks, LS & Happy, Susan and Paula, for stopping by. So good to hear from all of you. I wish you a very happy New Year! God bless.